In Canada, debates about religious views in school have never been as polarizing as those in the United States. Dating back to the Scopes Trial of 1925, discussions about evolution and creationism in American classrooms have continued unabashed. In this century, some American teachers have chosen to downplay or ignore the teaching of evolution altogether, after experiencing pressure from politicians or other groups. In Canada, controversies around this topic have centred on secondary issues, such as politicians attending conferences where speakers decry evolution and praise “biblical authority.” Some high-profile backers of conservative political parties have issued similar statements over the years. This month marks the 159th anniversary of the publication of On the Origin of Speciesby Charles Darwin, the scientific book that introduced the concept of evolution by natural selection. Research Co.decided to ask Canadians about their views on creationism and evolution and whether both belong in the country’s schools. Across the country, 68% of Canadians side with the notion that humans evolved from less advanced life forms over millions of years. One in five (21%) believes God created human beings in their present form within the last 10,000 years. The remaining 12% are undecided. The divide is not too pronounced when it comes to gender, with 22% of women and 19% of men believing in a creator deity. Age plays a larger role in shaping views, with 24% of Canadians aged 55 and over identifying themselves as creationists, compared with 18% of those aged 35 to 54 and 19% of those aged 18 to 34. There are some regional differences as well. Forty-one per cent of residents of Manitoba and Saskatchewan say they tend to believe in creationism, followed by Alberta at 24%, Atlantic Canada, British Columbia and Ontario at 22% each and Quebec at a paltry 10%. The findings can be interpreted in several ways. Some may simply look at Canadians who agree with Darwin outnumbering those who choose “the Bible” by a sizable 3-1 margin. But when we asked Canadians if creationism should be part of the school curriculum in their province, the numbers shifted. More than a third of respondents to the survey (38%) think the belief that the universe and life originated from specific acts of divine creation should be taught in schools. A larger proportion (46%) disagrees, and 16% are undecided. We went from two-thirds of Canadians siding with evolution, to less than half who think creationism has no place in the classrooms of the nation. The group that is more heavily opposed to teaching creationism in school is the one that most recently wandered through its halls. 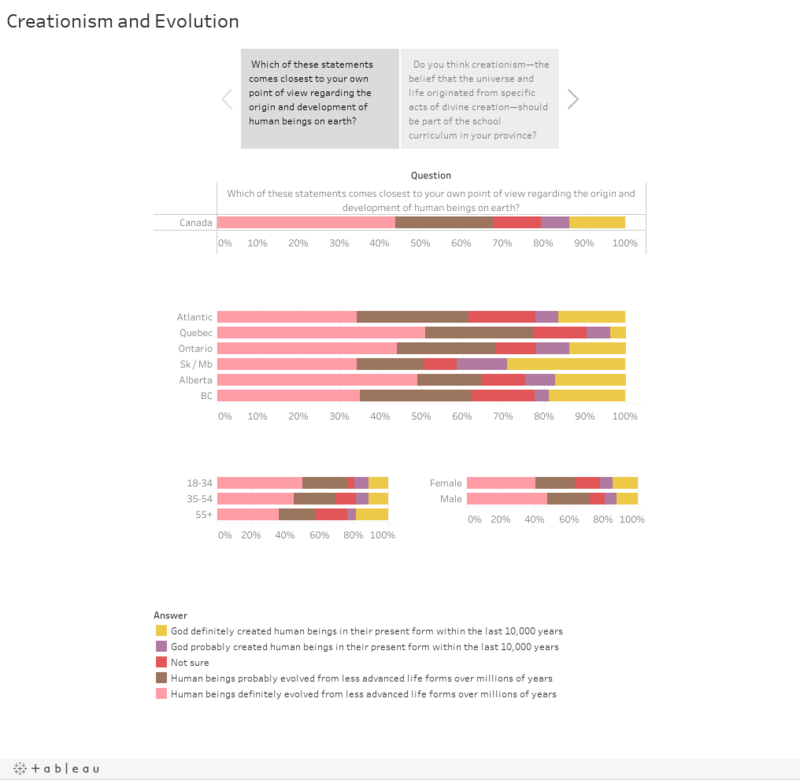 More than half of Canadians aged 18 to 34 (54%) think creationism should not be part of the school curriculum, compared with 44% among those aged 35 to 54 and 42% among those aged 55 and over. B.C. is undisputedly the province where most people, 55%, would keep creationism out of schools, followed by Quebec at 49%. Manitoba and Saskatchewan are next at 45%, followed by Ontario at 44%, Alberta at 43% and Atlantic Canada at 41%. There are many reasons for these regional variances. Over the past two decades, British Columbia has positioned itself as closest to secularism than any other region of Canada. Fewer British Columbians describe themselves as having “a religion” every time the census rolls around. Still, the last municipal election saw candidates running for school board seats – and winning – after outlining creationist views. Quebec has always been a land of contrasts when it comes to religion. The presence of a crucifix inside the National Assembly is debated extensively in a province where fewer residents are attending church services than ever before.